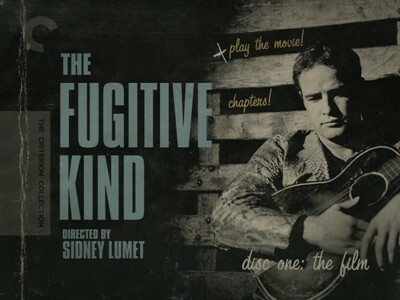 The Fugitive Kind was directed by Sidney Lumet, most recently seen on modern movie screens helming the fantastic Before the Devil Knows You're Dead. 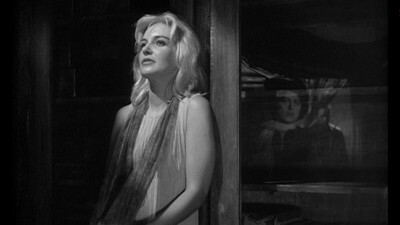 It was adapted by Tennessee Williams and Meade Roberts from Williams's play Orpheus Descending. It reunited the playwright and Marlon Brando, who had changed acting forever as Stanley Kowalski in Williams's A Streetcar Named Desire, first igniting the boards in the original stage version, then recapturing the flame in Elia Kazan's movie version. 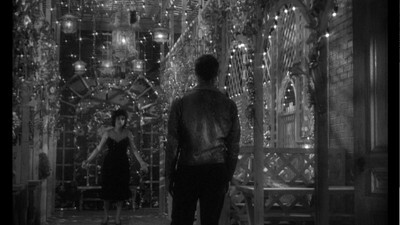 This time around, Brando plays Valentine Xavier, also known as "Snakeskin," named so for his snakeskin jacket. Val is a performer in love with his guitar, which he carries everywhere yet really only plays once (accompanied by an unconvincing overdub). When we meet Val, he's standing before a New Orleans court, having caused a ruckus at an illicit party the night before. His guitar is in hock, he was hired to go to the party for his other talents. Snakeskin is a stud. He oozes sexuality. Just about everything out of his mouth sounds like a come-on. Lumet and Sylbert shot The Fugitive Kind at a 1.66:1 aspect ratio, and this new digital transfer gives us a fantastic black-and-white anamorphic image. The contrasts between dark and light are expertly balanced, with deep, inky blacks and blistering whites. The surface image is mostly clean. There are a couple of instances where a faint line appears running vertically down the screen, and this line is very thin and not all that noticeable. It's likely an irreversible flaw in the source material. 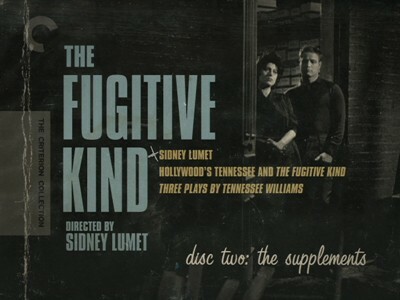 The Fugitive Kind was released on DVD once before, in 2005, and though I have not seen that disc, DVD Savant gave it very low marks, noting that the disc had "a disappointing non-enhanced 1:66 letterboxed transfer that doesn't allow what looks like some atmospheric photography to shine as it might." This Criterion reissue is obviously much better, having corrected both of Savant's major complaints. The new mono mix of the soundtrack sounds great. There are subtle plays in volume, from quietly spoken lines to big bursts of music and raging weather. There is no distortion or external hiss, the DVD sounds excellent. English subtitles are available for the deaf and the hearing impaired. Criterion's The Fugitive Kind is a 2-disc set in a standard-sized clear plastic case with a staggered double tray. The 16-page interior booklet is generously illustrated with photos, alongside cast and crew credits and an essay by David Thomson about the production. The chapter listing for the movie is printed on the inside front cover. DVD 1 is devoted to the movie, DVD 2 is all the supplements--and what supplements they are! The lead extra is a new interview with Sidney Lumet (27 minutes, 45 seconds), who talks about his history with Williams's material and his personal interpretation of what his plays are about. He discusses directing Williams on television, as well as the history of Orpheus Descending and how it became The Fugitive Kind. He also talks about learning his craft in TV and moving into motion pictures. That TV work is actually presented here for our pleasure. Fans of live television of the 1950s will be pleased to find the hour-long Kraft Television Theatre production, Three Plays by Tennessee Williams, collecting "Moony's Kid Never Cries" (starring Ben Gazzara and Lee Grant), "The Last of My Solid Gold Watches" (starring Thomas Chalmers), and "This Property is Condemned" (starring Zina Bethune and Martin Huston). These three plays show three different ages, three stages of life: childhood/pre-adolescence in "Property," early adult life in "Moony's," and old age in "Gold Watches." In each stage, there is a sense of disillusion and disappointment, the characters have all seen that the promise of whatever life has preceded them was false, and the tomorrow they hoped for is not waiting for them. In some cases, it's their own future that is faltering, and in the case of Chalmers in "Gold Watches," it's that the whole world is changing and going in such a way that not only has he become obsolete, but all that he thought he accomplished no longer matters. The theme in Williams is always of a dream deferred. Even in The Fugitive Kind, Snakeskin has realized that the high life is not so high, and Lady has discovered love is a hard, bitter thing. These one-acts move quickly, and the acting is exceptional. Sidney Lumet was a facile director, agile in the live arena, and this production sizzles. The final extra is a documentary called Hollywood and The Fugitive Kind" (27:30). It features Robert Bray and R. Barton Palmer, the authors of Hollywood's Tennessee, a book about Hollywood's many adaptations of the Williams oeuvre. They contextualize the original plays and talk about how the material translated to the motion picture format and in this case, arguably even improved on the source. It includes a more detailed look at the evolution of the this manuscript from its original form as Battle of Angels to Orpheus Descending and on to The Fugitive Kind. 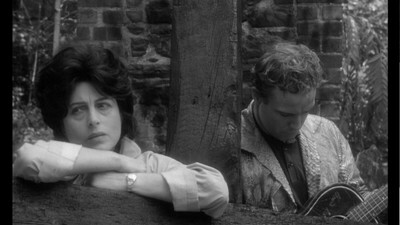 The Fugitive Kind - Criterion Collection is a double-disc release of the 1960 drama starring screen legends Marlon Brando and Anna Magnani. This hot-blooded, overtly poetic adaptation of Tennessee Williams is a stylish, emotional production from director Sidney Lumet. Featuring top-notch acting and a near-surreal lighting style, the tragic love story is infused with sweat and tears, and it's also a snapshot of a tumultuous political time in the American South. With a new transfer and a trio of excellent extras, The Fugitive Kind - Criterion Collection is Highly Recommended.